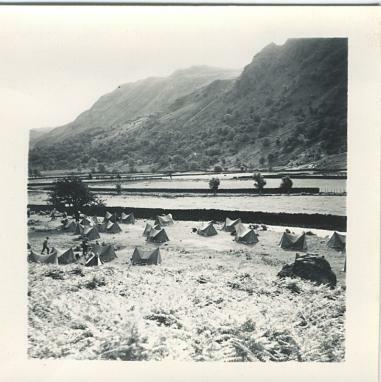 After leaving Accrington on Monday August 24th, 1959, we arrived at the Mountain School on Ullswater at 8pm. We were quickly split into groups of 12; our group was called 'Oates' after the famous explorer. We spent the first two days map reading, circuit training, knot tying and coiling climbing ropes, with the rest of the week being spent getting us fit for the remainder of the course; that is, breaking in climbing boots, going for ten mile walks in mountains, running 100yards, running two miles and rock climbing! After a 16 mile walk to Troutdale, across Grisedale Pass, a fell walk over Robinson Pike, Dale Fell and back through Coniston Pass, it was time to get out the canoes. After crossing Derwent Water and Bassenthwaite, we were rewarded with a moment of fame as the local television announced that 'the boys from Outward Bound' were the first ever to canoe to Cockermouth by lake and river. One of our tasks was to complete a 62 mile walk over three days. In the evening of the second day I scalded my foot and had to complete the final 26 miles with only one boot on!